Does iTunes Backup Text Messages? How to Restore? The software which Apple publishes to enable you to manage your iPhone/iPad/iPod Touch is iTunes. It does a very good job. It is free! One of the jobs which iTunes does is backing up your data to your local computer, which is usually referred to as an iTunes backup. 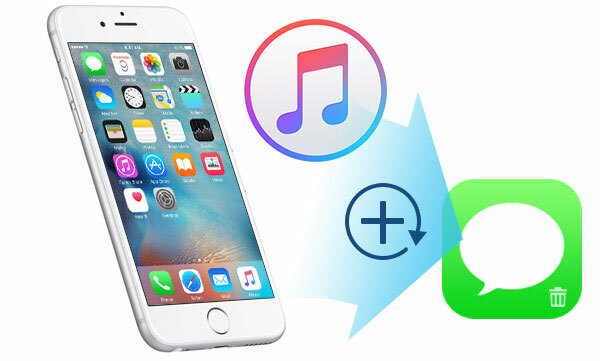 You can check this post to see how to backup iPhone/iPad to iTunes. This data is backed up as one file. 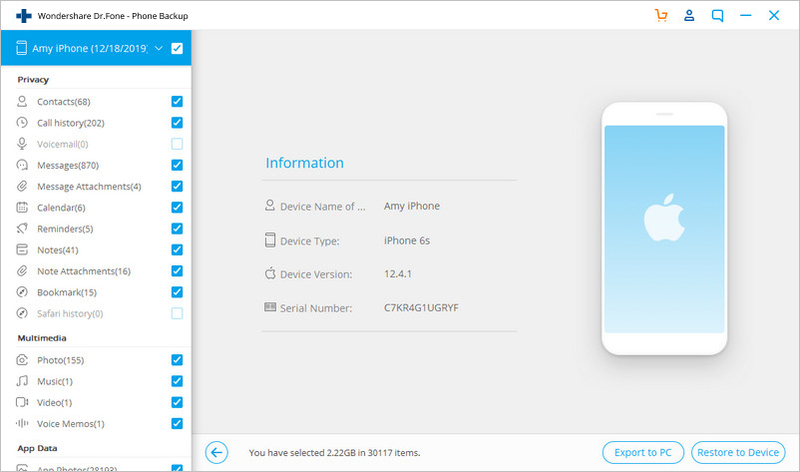 All the information on your iPhone/iPad/iPod Touch is stored in one file, which acts as a single container, for your addresses, photographs, music, messages... everything! Among that single file of data, iTunes backs up your photos, videos, music, your SMS messages and notes etc. You cannot access, you cannot ‘see’, you cannot download individual, specific items from within that container. You cannot extract individual items from the backup file. 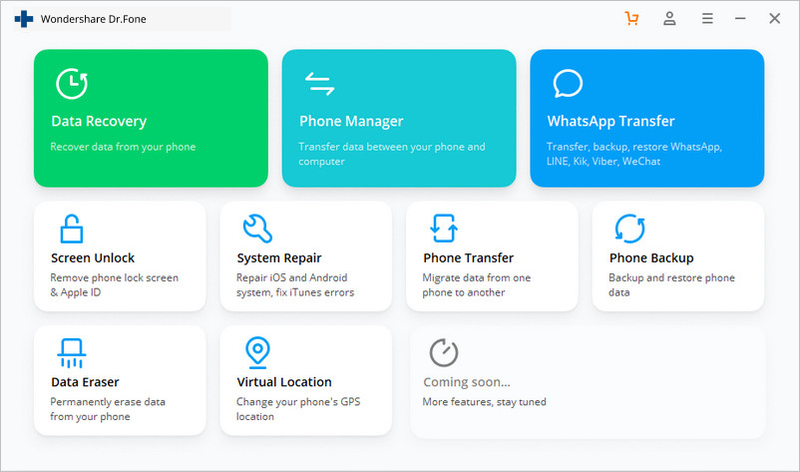 We at Wondershare, the publishers of dr.fone and other high quality software, put your needs first. 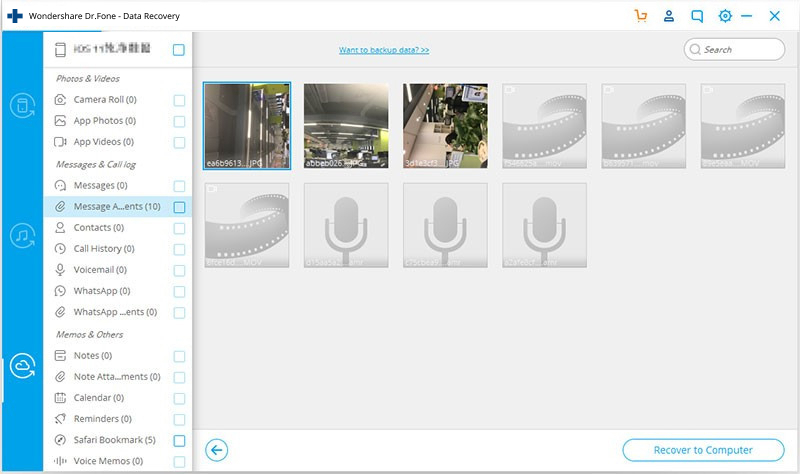 We think that your notes and text messages can contain very important, even sensitive data, and it might be helpful to access those notes from within a backup file. As we have said, iTunes will not allow you to do that. However, dr.fone is able to very reliably choose any specific file from your backup, and restore it for you. Apple’s iTunes will back up all the data contained on your phone, by default. Let us look at some simple steps which you might take to do the same thing in a better, more intelligent and considered way. 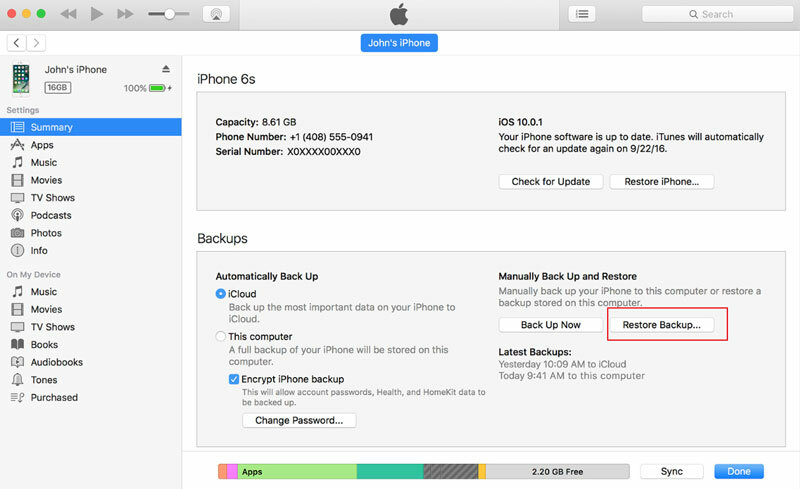 There is the option to selectively backup then preview and restore your iPhone notes and text messages? This can be done with dr.fone - Backup & Restore (iOS). It is the flexible approach, which gives you choices. One click to backup the whole of your iOS device to your computer. Allows you to preview and restore any item from a backup to a device. Export just what you want from the backup to your computer. Step 1. 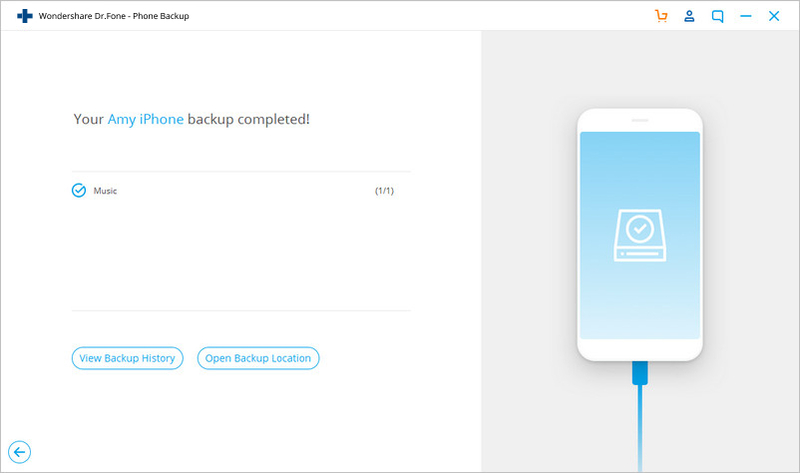 Once you have downloaded the program, and installed it on your computer, you should run the dr.fone progam and choose ‘Backup & Restore’. The dr.fone opening screen – giving you clear choices. Step 2. Connect your iPhone to the computer. When the program detects your iPhone, you can choose the file types which you want to backup. In the situation where it is just your notes and messages which you are interested in, you would just check those items (top left and top right below) with a tick in the box. Simply click ‘Backup’ to begin the process. Which items do you want to backup? Step 3. The process of backing up will take a few seconds. When it has completed, the program will continue to scan the backup file and display all the content which is available to be restored. It is always good to see smiling faces. Step 4. In this case, we are only really interested in the notes and messages, but you can pick any item which you want to recover and tick it, that is put a check mark in the box next to the item. As you can see below, you can choose to restore to your computer, or direct to your iPhone/iPad/iPod Touch. You can preview everything – in detail! When you back up your iPhone using iTunes your text messages and notes are automatically backed up as well. 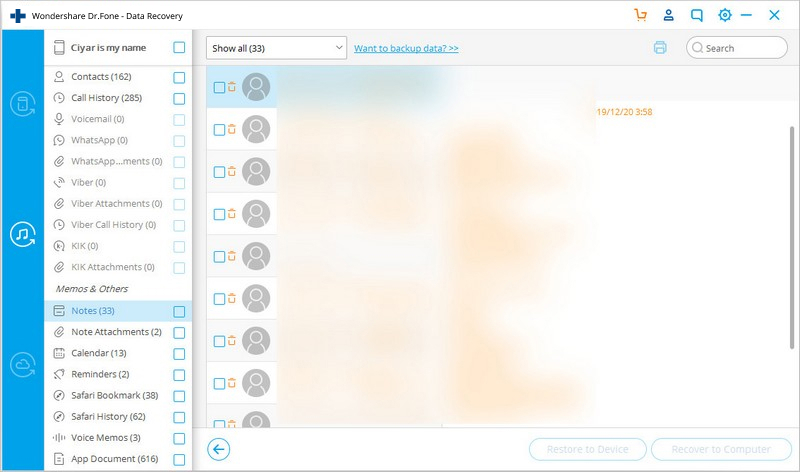 Unfortunately, you cannot choose exactly what it is which you want to backup, that is which individual items you want to backup. You only have the choice to back up your entire iOS device. Here's how to back up your iPhone using iTunes on Windows. Step 1. First thing you need to do is to open iTunes and plug your iOS device into your PC. Depending on which device you own, you will see in the top menu bar of the iTunes window a small icon which identities your device. Step 2. Clicking on that button will open another window that provides detailed information about your device. 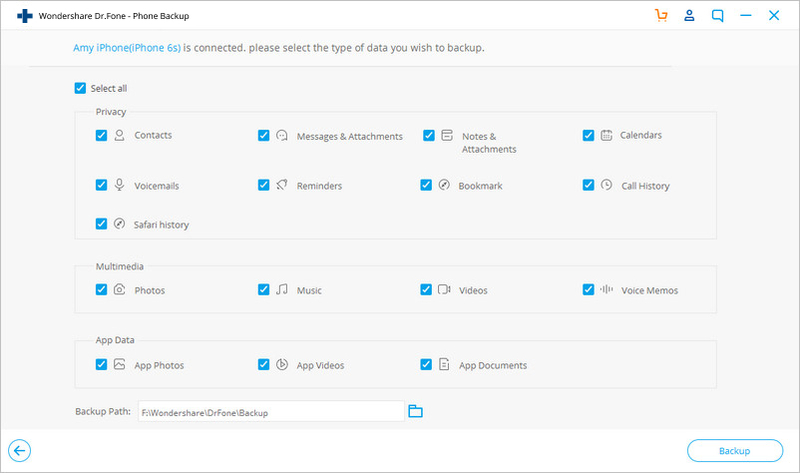 You can see the backup section below the main information. 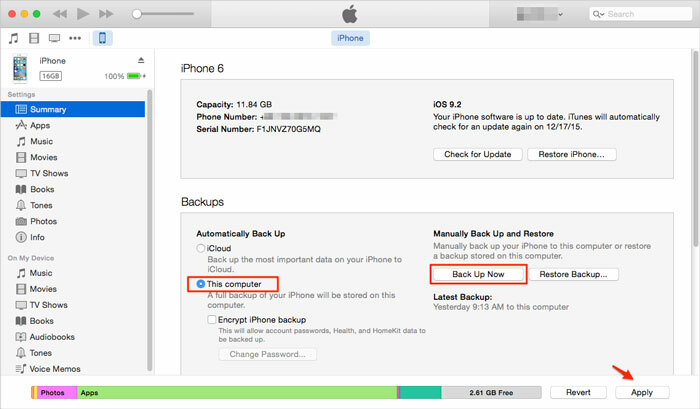 to do a full backup of your iOS device choose 'This computer.' By doing so, all of your data will be backed up to your computer. In addition, you can choose 'Encrypt backup' to make sure others can't access the personal data that was backed up. Step 3. To start the backup process, click ‘Back Up Now’. Sometimes, a pop-up may appear which will tell you about the apps on your iOS device that are not currently in your iTunes Library. If you wish to back up those apps as well click Back Up Apps to sync them with your iTunes Library. Of course, the more items you choose, the more storage space will be used. Then, iTunes will start the backup process of your iOS device. You will be notified when the process is finished, and all you have to do is press the blue 'Done' button. This is how you backup your notes and text messages to your iTunes in Windows. You have to do a full backup of your iOS device and then your notes and messages will be saved as well. 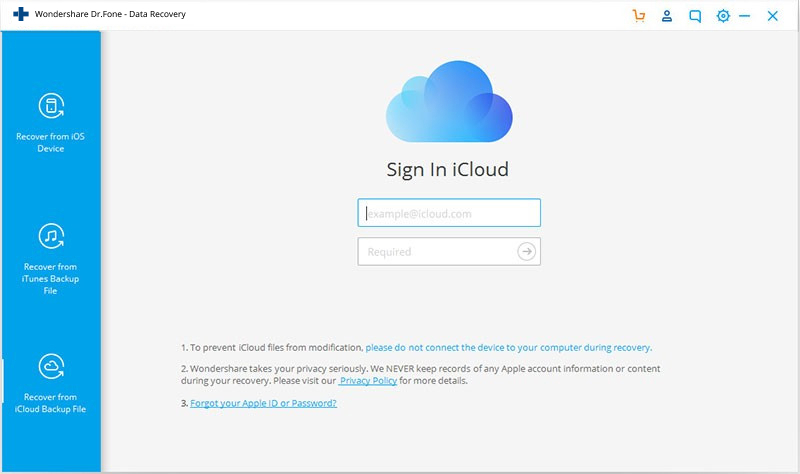 Before you begin backing up your data, make sure iCloud is turned off on your iOS device. Find the symbol for your device on the left side of the iTunes window. Right click on your device and select 'Back Up'. And, that is it! You just have to wait until the backup process is finished. It is when you read a list like that, it is made very clear just what a huge part of your life your iPhone has become. In order to restore your iTunes backup, you have to connect your iOS device first. Then, run iTunes, if it does not do so automatically. When your iOS device appears in iTunes, click on the ‘Summary’ button. Under the ‘Backups’ menu click ‘Restore Backup...’. Choose the backup you want, and click ‘Restore’. Wait for the restore process to finish. It may take a while. Once again, keep in mind that all your data will be overwritten with the data from your selected backup. The free software which Apple publishes to help you manage your digital life, your phone in this particular instance, is iTunes. It does a good job. However, it is limited. In respect of backing up, keep your information safe, dr.fone - Backup & Restore (iOS) does a much better job. But, what if we told you that there is software that allows you to preview and choose what you want to restore from a backup. 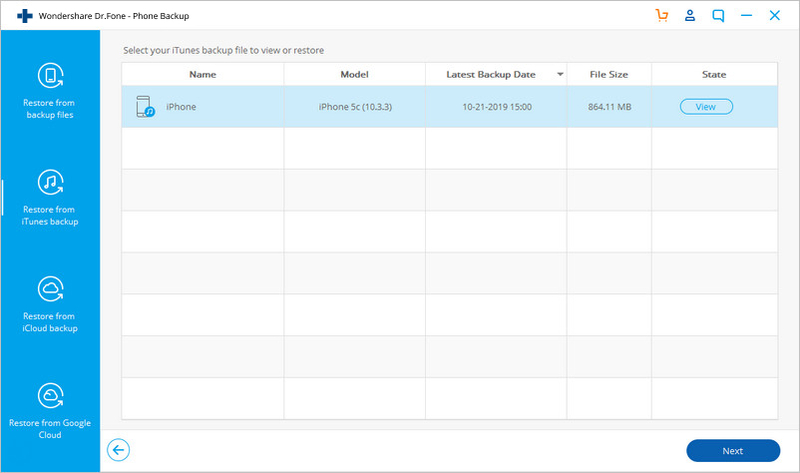 It is called dr.fone - Backup & Restore (iOS), letting you extract both iTunes and iCloud backup content. Selectively restore data from iTunes backup. Restore data by scanning iPhone/iPad, extracting iTunes backup and iCloud backup. Retrieve contacts, messages, photos, video, call log, etc. 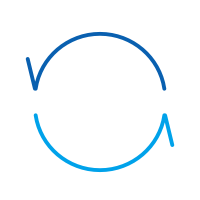 Selectively preview and restore any data you want. Let us walk you through the steps to doing just a couple of the things which dr.fone might do for you. Step 1. Select "Restore from iTunes Backup"
Download and install dr.fone - Backup & Restore (iOS) on your computer. Choose the ‘Restore’ feature and click ‘Restore from iTunes Backup’. The software will detect and display all the backups that are available on your computer automatically. You can choose the right backup based on its name or the date it was created on. Choose by name – are you Lisa or Administrator? Once you have chosen the backup click ‘Start Scan’. It may take a few minutes before all the data is extracted. The available data will be clearly shown. After your data is extracted you will see all of your files categorized. You can preview every file and choose the ones you want to restore. If you cannot see a file which you are looking for, you can use the search bar in the top right corner. We try very hard to make things very clear and helpful. After launching the program on your computer, select ‘Restore from iCloud Backup File’. And then, you need to enter your iCloud username and password. 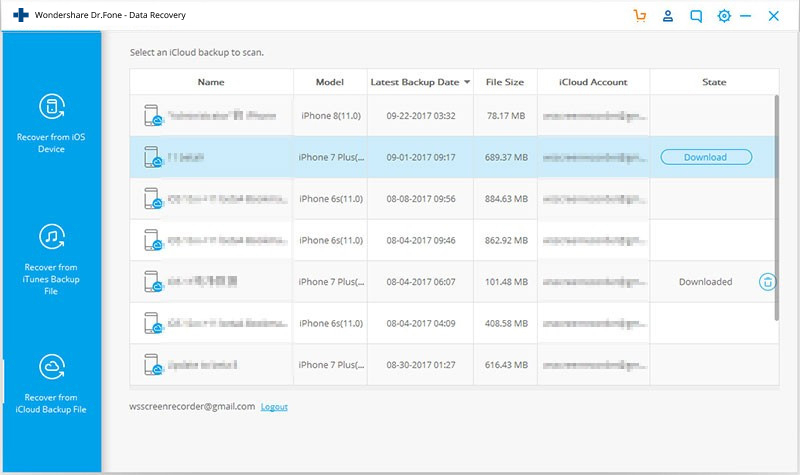 Once you are logged in, you will see a list of your iCloud backup files. Again, choose the right file, probably the most recent iCloud backup, then click 'Download' to save the file to your computer. If we are concentrating on notes and messages, you can preview very clearly what is available. You are able to read the files contained within your iCloud backup. You can choose the specific messages you want and restore to your device. It is always great to have choices, especially when they are so clear. How to Solve iMessage Waiting for Activation Issue on iPhone? Fed up of seeing the iMessage activation error pop-up randomly on your iPhone? Here is all you need to know about the iMessage won’t activate issue. This article shows you three ways to restore deleted text messages on iPhone by yourself in simple clicks. Get in to follow it now! Wondering what you can do to fix a frozen iPhone? Here are 5 solutions that work very well. > How-to > Messages > Does iTunes Backup Text Messages? How to Restore?